Here it is, the most popular appetizer during the fasting month or Ramadan. After struggling against hunger & thirst for the whole day....it is advised not to digest a heavy meal at once. Otherwise our stomach is forced to work so hard immediately ha ha... In this case "Kolak Pisang" is the right choice as a starter. It tastes sweet and delicious,... moreover the aroma of pandan leaf is really tempting !!. Surely you can make this appetizer anytime and anywhere. The ingredients are very easy to find, includes in the west countries. And the making process is also quite simple and fast. Of course you can vary the filling fruits and mix match to your preference. But experience told me ..after trying to mix this and that, I should admitted that the combination between banana and jackfruit is the best! And now this light dish has become a favourite in the family. At least my husband has agreed with me. It tastes simply superb!! 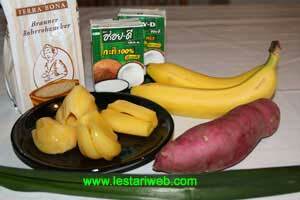 Peel-off the cassava or sweet potato, wash and cut in cubes. Put palm sugar, sugar, pandan leaf & cassava / sweet potato in a saucepan. Add the water into the saucepan and bring the mixture to boil. Continue to cook until the cassava / sweet potato becomes tender. While bpoling cassava, peel-off bananas and cut about 1 cm thick. 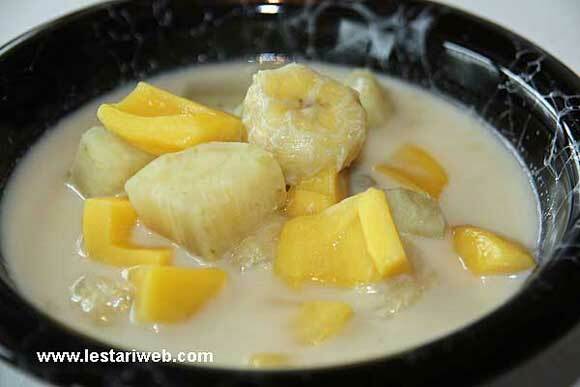 Add the coconut milk, sliced banana & jackfruit. Add salt to taste. Continue to cook on medium heat until the mixture getting boiled again. Stiring occasionaly. Ensure that the banana & jackfruit not too overcooked. Serve while warm.